It’s virtually impossible for Smartphone OEMs to keep their devices secret before they even receive their first teaser promo. Whether it’s a photo of a device being caught in the wild, a photo of the device in the actual factory, or even promotional renders and/or spec sheets. Those who are paying attention to Android publications tend to know a great deal about most devices before they are revealed to the public. 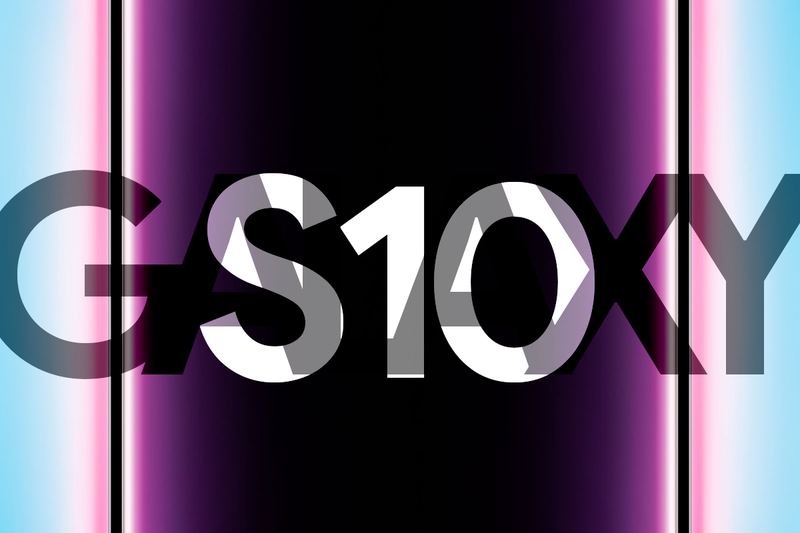 We have learned a lot so far about the Galaxy S10e, Galaxy S10, and the Galaxy S10+ and now some leaked documents have revealed the full camera specs of all of these devices. When it comes to flagship smartphones, there a lot of hardware details that can be determined by what has already been made public. Silicon vendors like Samsung and Qualcomm show off their latest Exynos and Snapdragon chipsets before they make their way into smartphones. The same can be said about RAM and storage (types and sizes) as well but these are typical assumptions due to an OEM wanting to use the best available in their smartphone. 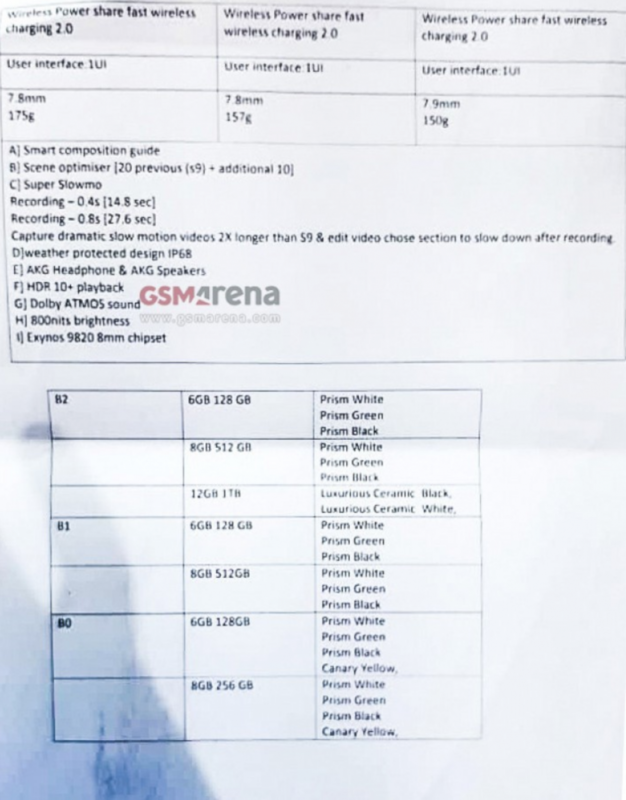 When a spec sheet is leaked we get a more detailed look at upcoming devices and we have recently learned the full camera specs of all three upcoming Samsung Galaxy S10 smartphones. 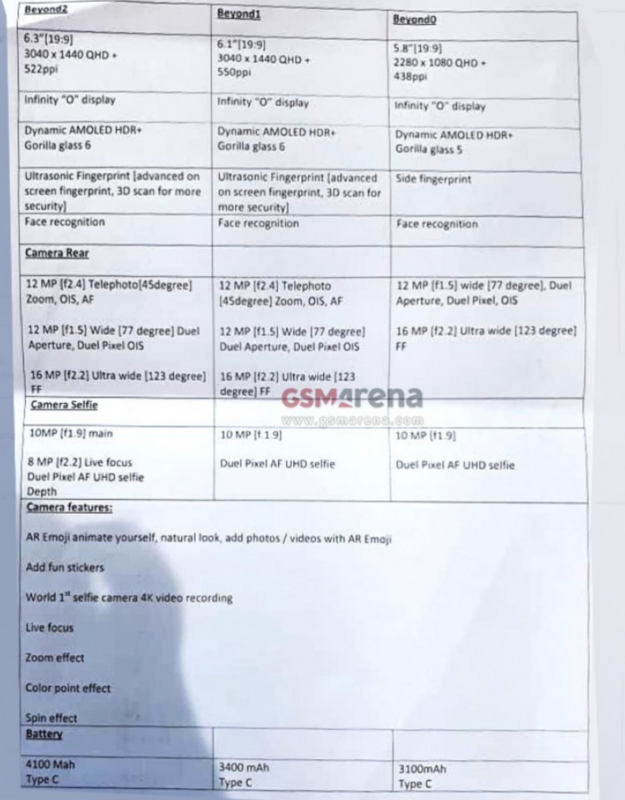 There’s also another sheet that talks about the camera features of these upcoming Samsung devices. They are merely bullet points but mention a smart composition guide, a scene optimizer, and two super slow-mo modes. They describe these two slow-mo modes as being able to create dramatic slow-motion videos that are two times longer than the Samsung Galaxy S9. And they will come with the ability to slow down a section after the video recording has been made.